Scientists with the National Oceanic and Atmospheric Administration collect data and conduct research that supports the agency's regulatory missions. 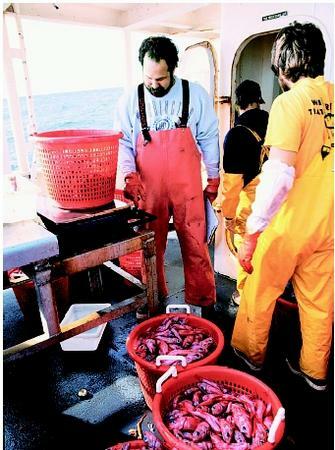 Here, fisheries biologists with the National Marine Fisheries Service study populations of groundfish off the Oregon coast. Agency. During this time, a new approach to environmental regulation was beginning in which separate agencies were being consolidated in recognition of the interrelations existing in the environment . NOAA is charged with the mission of collecting scientific information, predicting changes in the environment, and protecting life and property. In the years since its formation, NOAA's efforts have provided a better understanding of the behavior of natural systems, and how to effectively manage resources to allow for economic development while protecting environmental quality. NOAA gathers information and conducts research primarily through its five major organizational units. Together, these organizational units work to achieve the agency's goal of ensuring effective management and stewardship of natural resources. NOAA collects much of the data on water in the oceans and atmosphere. These data are used by an array of decisionmakers, scientists, special interest groups, and the general public, ranging from applications as diverse as ocean-related policy-making, to investigations of climate change, to the planning of daily personal activities. Perhaps the most well-known organization within NOAA is the National Weather Service (NWS). The NWS collects weather data and provides forecasts and warnings to protect the nation's residents and to provide communities with the information needed to plan and prepare for weather events. Commercial weather organizations also use information provided by the NWS to provide the public with weather forecasts. The National Environmental Satellite, Data, and Information Service (NESDIS) operates the nation's environmental satellites, providing valuable information about weather and climate used by the NWS for short-term forecasting and long-term monitoring and prediction of climate variation. The organization also maintains large databases for meteorology , oceanography, geophysics, and solar-terrestrial sciences used by scientists working to better understand Earth systems. The National Ocean Service (NOS) provides information to coastal communities and those navigating ocean waters to allow for the safe use of ocean resources while also preserving and protecting those resources for future use. The NOS also administers the National Marine Sanctuary Program, which, like the U.S. Department of Interior's National Parks Program, protects areas identified for their biodiversity , ecological integrity, and cultural legacy. The sanctuary program was created in 1972 by the Marine Protection, Research, and Sanctuaries Act. NOAA Fisheries, or the National Marine Fisheries Service (NMFS), studies and manages marine fisheries, conserves fishery habitats , and enforces federal statutes, such as the Endangered Species Act, the Marine Mammal Protection Act of 1994, and the Magnuson-Stevens Act of 1996. This organization's research and management efforts support the exploitation of living marine resources while working to achieve sustainability of resource use. Office of Oceanic and Atmospheric Research. The Office of Oceanic and Atmospheric Research (OAR) is NOAA's primary research arm. OAR maintains several research laboratories, including oceangoing vessels and undersea research centers. It also works with academic institutions, providing research grants to generate new knowledge about the oceans. NOAA's plan for the future includes the strong promotion of sustainable development. As a bureau of the U.S. Department of Commerce, NOAA collects information and conducts research to allow for economic growth and the wise use of natural resources while maintaining the quality of the environment. SEE ALSO Climate and the Ocean ; El NiÑo and La NiÑa ; Endangered Species Act ; Fish and Wildlife Service, U.S. ; Fisheries, Marine: Management and Policy ; Geospatial Technologies ; National Park Service ; Weather and the Ocean . U.S. Department of Commerce. NOAA Strategic Plan: A Vision for 2005—Executive Summary. Washington, D.C.: U.S. Department of Commerce, 1998. National Marine Sanctuaries. <http://www.sanctuaries.nos.noaa.gov> . NOAA History. U.S. Department of Commerce. <http://www.publicaffairs.noaa.gov/grounders/noaahistory.html> . NOAA Home Page. U.S. Department of Commerce. <http://www.noaa.gov> .